Ella is a precocious and fiercely competitive actress with a desperate need to make her father David, a famous playwright, proud. Over the course of a boozy, drug-fueled evening, Ella and David pass the time digging into family history, artistic passion, and unspoken fears as they wait for the reviews, but what is unearthed can't simply be reburied. This daring play pulls the audience into the middle of a deeply complicated relationship, exploring how we build and break idealized versions of our loved ones. Create an Upper West Side pre-war eat-in kitchen, compliments of our scenic designer, Joy Ahn. Realize Becca Jefford’s lighting design, which transforms the kitchen into a set when the show takes a turn for the metatheatrical. Pay rent! We love our home at The Den, but it comes with a price tag and that first week’s rent before we start seeing ticket sale revenue is where you come in. Pay our actors and director, pay our designers, pay our Dialect Coach, Carrie, who has had her work cut out for her on this script! Pay for the performance royalties. Audiences don’t often realize this invisible cost, but it’ll run us $100/night to perform Pray for You. Pay for LaCroix during tech! There are a million little costs that go into making a production, including keeping our team happy and hydrated. A donation of any size makes a big impact during tech week when cash flow is tightest. Our fearless stage manager, Anastar Alvarez, making sure we’re word perfect in rehearsal. Every dollar raised will go directly towards producing this CHICAGO premiere. 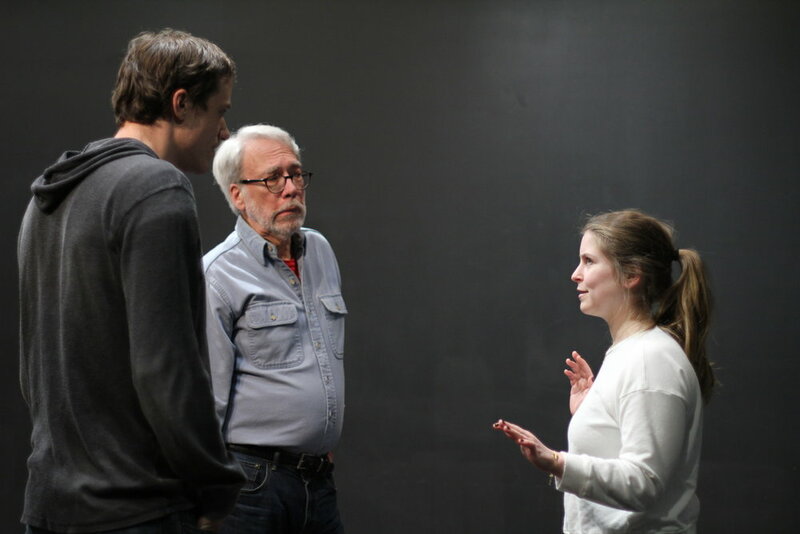 Cole von Glahn (director), Tim Kidwell (David), and Amanda Fink (Ella) puzzle through a moment in scene two.